What’s the new history for Frankenstein and the Creature Commandos due to the Flashpoint? Find out after the jump. Previously in Frankenstein: There’s not really any previously to be doing here, so let’s just get too it. We open in the North Atlantic in 1942 with a group of American soldiers looking for a Nazi patrol. The group finds a large figure frozen in the ice and then is hit by an ambush. When down to the last man, said figure bursts from the ice and slaughters the Nazis while muttering cryptic things about the mass amounts of evil as where there is evil, he lives. The cryptic comments and speech also give a bit of insight into just what Frank might be capable of as he picks up on both the evil of the men and radio and radar waves. I think it was a cool approach. Flash forward a year and we are looking at Project M, a secret military project designed to turn men into “Living embodiments of this century’s classic archetypes of fear.” There’s a total of three: a vampire (winged and ugly so there’s a plus), a wolfman, and a fish-monster (think creature from the black lagoon), and we’re given a small amount of background on each. The nature of the experiments bothers Frankenstein as he recounts a small bit about a man who had done something similar in his past and his unfortunate fate. The next jump takes us to Germany in 1945 just outside Hitler’s bunker. Shrieve, the last man in the Arctic party, leads the monsters of Project M and he and Velcoro, the vampire, do get some good back and forth going. Frankenstein’s speech now has a healthy mix between cryptic and larger than life monologuing adventurer, until they meet a German superhero. The German hero’s monologue is quite rudely cut short as Frank guts him with the Sword of Michael and bluntly says “Shut up.” Bust down a door, slay the Nazi commanders, and head home. Another year later and instead of getting the cure as promised, all of them (including Frank) are getting put into some sort of suspended animation just in case they become useful again in the future. Why the government thinks this will work is beyond me considering how they found Frankenstein to begin with, but it gives us a story at least. Come to present day, Frank wakes up (uh, duh) and releases the others so they can find out it is actually 2011. Well, the government can’t stand for this and sends in the world’s foremost monster hunter, Shrieve. Monsters look cool. 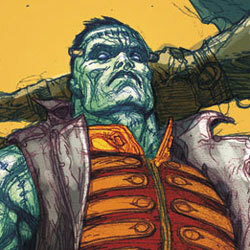 Seriously, Frankenstein looks like a total badass even when he’s not doing so hot. All of the monsters are quite gruesome, but still feel human, while the bad humans actually look more terrifying in their own way. And then having the same look on Shrieve’s face when Frank kills the first Nazi’s he meets as when he kills Hitler was just gold. The “S” Shield on the door to the lab is a fantastic hint as to where they actually are without giving us any info. The artwork here was just flat out impressive and I’m glad to have it. The history moves at a good clip so we can actually set up what the actual meat and potatoes will be. Lemire also does a good job of telling us who the characters are and what they need without it feeling like straight up exposition, which was an actual concern for me. The little love story between Nina, the sea-creature, and Griffith, the wolfman, is also rather cute. This has been the best story I’ve read out of Flashpoint so far and I’m happy I got it, definitely a 4.5 out of 5. Last thing, poor Man-Bat. Previous ArticleCritical Hit #101: Lower the Longboats! 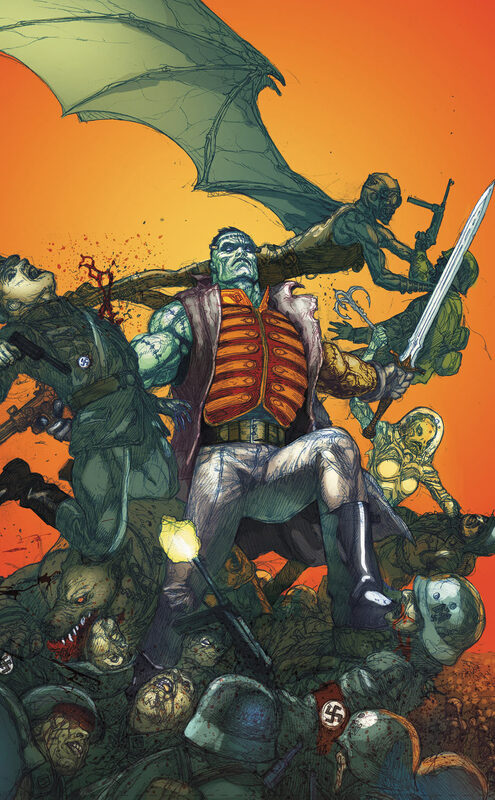 Having read the old Monster Squadron stories way back in “Weird War” (even though that group didn’t have the “real” Frankenstein’s Monster but a soldier that resembled him) I’m really interested in this character, especially since he’s now one of the “52”. I REALLY tried to follow the Seven Soldiers series by Grant Morrison but for some reason I just never understood the whole thing. This may be my chance to get into that character a bit more. I’ll never not be able to call the Vampire simply Velcro.